2006; 268 pages. Genre : Fiction. Overall Rating : A.
I'd describe Bill Bryson as a kinder, gentler David Sedaris, although there is still a lot of hyperbole and caustic wit to go around. 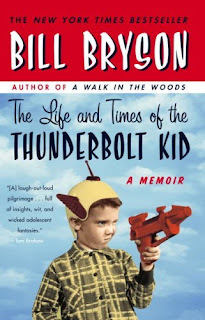 TL&TotTK is a series of memoirs about Bryson's boyhood days. He was born in 1951, so this is primarily about life in the late 1950's to early 1960's, growing up in Des Moines, Iowa. Simply put - this is as hilarious of a book as I've ever read. From cover to cover, I kept laughing out loud, which was distracting to Liz as she read. And since I was born within a year of Bryson, a lot of his boyhood memories are also mine. Things like : silly putty and slinkies; lincoln logs and model airplanes; Sky King and Roy Rogers; bumper cars and fig newtons; wearing galoshes to school and being sent to the cloakroom; and the widest selection of comic books that any generation ever enjoyed. Last but not least, the stupidest, annoyingest, inanest game/toy that was ever invented - electric football. Not much, since I give this an "A". Most of the negative reviews seem to come from dittoheads who are irked that Bryson at times reminisces about the political foibles of that time period. Yes, we had hula hoops and TV dinners. But we also had a House of Un-American Activities Committee; rampant segregation, and A-bomb tests in the Nevada desert that spewed radioactive fall-out all over the country. Sorry, guys. That's part of this era as well. The other negative that got cited a lot - and I happen to agree with this - is that Bryson sprinkles the book with a few too many 4-lettered words. I have no moral objection to that, provided it serves a purpose. Here, it seemed to be forced and unnecessary. Finally, while those aged 50-65 will relate to this book, there may be a bit of a disconnect for anyone younger. For a popular author with a dozen books to his credit, finding Bryson's books in a bookstore is a daunting challenge. Yeah, I could ask the help desk, but where's the sport in that? You'd think his books would be filed under "Humor", but neither store did that. TL&TofTK was over in the "Literature" section at Borders, but that was the only Bryson book there. This past weekend, I found a stash of his other books at the used bookstore under "Travel". They're still written in Sedaris-style, but deal with living in England, hiking the Appalachian Trail, and/or traveling around Australia. He has a couple linguistic-themed books to his credit, and I still haven't found where either store stashes those. I don't think I've enjoyed a book this much since Slaughterhouse Five. I can see me going on a Bryson kick for the next few months. If you want to get a feel for the bright side of the 1955-65 decade, this is as good as it gets. As for its darker side, well, that's what the book I'm reading now is all about. I really like Bill Bryson's style of travel book. His books are move of a comment on society or the way things are than they are a book about traveling specifically. I've only read a couple. I read his book A Walk in the Woods about hiking the Appalachian Trail during my period of obsession about hiking the trail and climbing Everest. I think I read another, maybe about traveling in Europe or something like that? I do find him humorous, but since you've pointed it out, Hamilcar, I do recall that he used a lot of 4 letter words that seemed somewhat pointless. they had about 4 copies of A Walk In The Woods at my used bookstore, so I decided to skip it for now. instead, i bought "I'm A Stranger Here Myself", which apparently is a series of weekly articles he wrote about life in the USA after he came back from living 20 years in the UK. I've seen that one but never read it. Of course, let us know how it is. i really ought to read A Walk In The Woods since i was born and raised real close to the Appalachian Trail (Berks County). any chance that you'll be reading and reviewing other Bryson books? I'm discovering the resources of my public library. Philadelphia has a huge library system. All the books I want seem to be at other branches. So I request them online and they show up at my neighborhood library! I'll check to see what they have. I love the library system! Ours works the same way, and we're always requesting things from other branches.